We are engaged in delivering Single Head Automatic Linear Piston Filling Machine being an esteemed figure in the industry. As a Manufacturer, Exporter & Supplier, we cater to the specific requirement of customers in different quality. Quality control team, hired by us, is committed to raising the quality up to the industrial quality standards. Our offered range is recognized for durability, high performance and sturdiness. This quality is available for our valued customers at affordable rates. 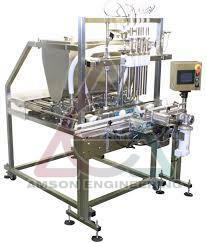 Automatic Conveyor type Single Head Piston Filling Machine Model AEAPPF1000 is an universal filling machine. With this machine, you can fill paste material very accurately and fast into any containers. A very user-friendly model with low maintenance requirement. This machine is equipped with pneumatically operated filling mechanism and a motorized conveying unit. The whole unit is strong and used are heavy duty parts. Less rotating parts means low maintenance. Accuracy of filling is maximum up to 0.5% of the volume. Various volume capacities from 50 gm to 1000gms can easily filled with this machine. Bigger volumes also available on request. Complete GMP Model suitable for Pharmaceutical Applications and food industries. Tri-clover (sanitary) fittings attached so that easy product change over after cleaning possible within minutes. Filling volume can be adjusted without stopping the machine with hand wheel. No dripping so no wastage of product and so clean filling assured. Container stopping facility attached for filling, so the conveyor is moving all the time to reduce the time lag. Operating Panel Box with all electrical control switches, timer mounted away from fill area. Machine weight - 285 kgs approx. Gross weight - 400 Kgs. Output - 20 fills per minute with bigger nozzle. Fill Capacity - 100gms-1000gms as per barrel size and settable volume by hand wheel. Compressor required - 5.5 Kg.cm2, 4 cfm. (2 HP twin cylinder, 3/1 phase) to be arranged by you. 60 Liter Hopper comes with this machine; Also Material can be sucked from any overhead vessel.